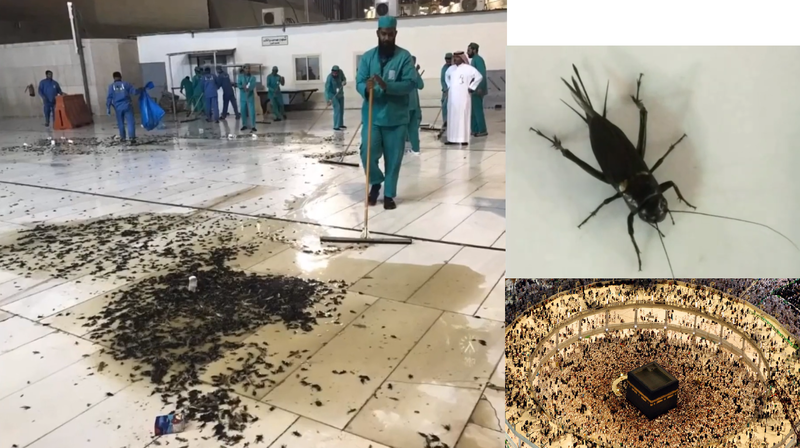 This Cockroach invasion in Mecca, Saudi Arabia, in the heart of islam, is a strong warning from Allah to the all the muslims in the world. I am God's sole warner and messenger for the end times, this is my presentation. This Coackroach and locust plague all over Saudi Arabia is a harbinger, and if you do not take heed, then the next warning will be much more painful and humiliating...and this will continue again and again, until you submit to Allah or you all die like cockroaches. Others before you have been plagued by locusts, Pharaoh and his people were much stronger and much more confident in their beliefs than you are...yet they were completely destroyed by God, because they were indeed true criminals. You have 2 ways: either you come back to the true path of Allah, or if you persist in your present version of islam, in your sectarism, in your association/shirk, in your idolatry, in your perversion, in your transgression... then you'll be physically destroyed by Allah. Allah has sent all kind of warnings to the muslims since centuries. Allah has enslaved the muslims by allowing their old enemies, the western world to invade them and to enslave them through colonization. The muslims have been crushed by the western world in a such a way....when before they used to be victorious over them. Is this not a sign to you? Since then, each new day is worse for the muslims, they have been completely defeated and humiliated by their enemies, they have lost all their wealth, they have lost their land, they have become the most ignorant people in the world, the less advanced ones whether we speak about technology, moral, intellect... the muslim are in last position in all categories. Is this not a warning for you? Since WW2, most of the wars have involved muslims countries, Allah has used your worst enemies, the zionist allies of Israel to destroy your country and to humiliate you in such a way: Iran, Iraq, Afghanistan, Pakistan, Libya, Syria, Lebanon, Mali, Yemen, Niger, Tchad, Nigeria ... and even when you country has not been attacked, God has appointed a zionist dictator on its top which makes you endure the worst humiliations. Is this not enough for you as a sign from Allah? Whatever is the country in the world, your muslim community has been victimized and humiliated with special laws made which ostracize you, and treats you as second-class citizens. Whereever you are on earth, Allah has sent someone to affect you with the worst humiliations and torments. Does this not remind you an episode? Today you're behaving like the people of Israel and EVEN WORSE. The muslim countries count the greatest number of pervets. Sexual harassement has become a plague in your countries, while you're depicting yourself as better than the non muslims. Don't you see that you've become the worse of the worse? This is why Allah has been plaguing you with all kind of torments and humiliations for centuries. You've invented your own books of religion (the hadiths Vs the Babylonian Talmund for the jews), you've completely abandoned the Quran. Quran S25:V30 And the Messenger has said, "O my Lord, indeed my people have taken this Qur'an as [a thing] abandoned." You've given your obedience to your clergymen, adorned with self claimed titles that you've invented, instead of obeying to Allah only. Religion is the exclusive property of Allah, the Quran is the sole and only Law of Allah, and not your filthy books of lies, the hadiths. Your hadiths are the worst insult agains the prophet Muhammad, and you dare say that you are honoring his memory by following them, it is the biggest lie ever invented against the prophet Muhammad. I am God's messenger, I seriously warn you that if you do not come back to reason, if you do not stop your idolatry of Muhammad, his companions, your savants of islam ... if you do not leave your hadiths and your pagan pratices, if you do not take Allah as your sole and only guide instead of following your clergymen, if you don't leave your sect and come back to the pure monotheistic way of Abraham, I warn you in all equity, that you'll die in a horrible way and you'll end in hell forvever. Le messie d'israël (antichrist/dajjal) annoncé par les rabbins en 2015? assalam. the surat 12:106 that you reported is not correct it is 12:40. I tell you just because you made the same mistake in other videos as well. thank you, you're right, I've noticed it too late, it is a bad copy paste.